Here’s a fine piece of art depicting the bloody spectacle of a Royal deerhunt in 16th century Germany. From this we can envisage similar activities that were undertaken in the Glens of Scotland of the period. Notice the hounds employed aplenty and all manner of entourage, each busy in his or her task, from Royal chase, right down to spectator. 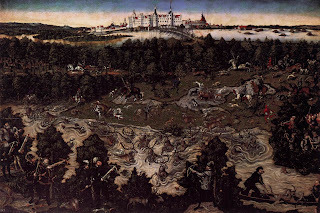 A similar, earlier work entitled The Stag Hunt of the Elector was also painted by Cranach - follow the links for detail and information. Now what shall we prepare for the Christmas Feast? 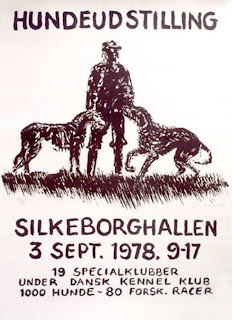 I just thought this little Hundeustilling promotional poster from the ninteen seventies to be of interest to readers of this blog. 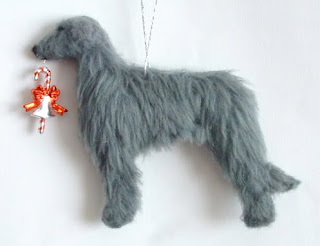 Looking for more Christmas stocking fillers for deerhound lovers that you know? If you don’t already own an original copy from wherst these little facsimiles were culled - why not visit Home Farm Books and obtain a copy. Home Farm has other books and reproduction/reprints that hound, terrier and country life folks may enjoy. Check them out and tell them Rogue sent you. Fal lal loo as fal lal la ! With a noble train of men and dogs. Not less in number than a hundred men. O'er hill and dale much havoc for to make. Whom left they at home but youthful Orree ! Who slept secure beneath the shadowy rock. 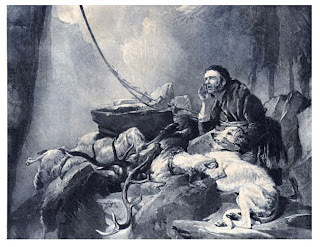 Full threescore grey hounds with their whelps they left. 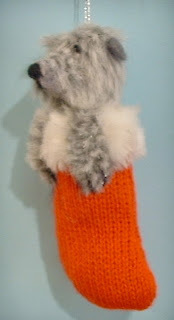 We found these little wool ornaments at an ebay traders little online shop - visit Gemaim by clicking the link and check out the pics below to see what the well decorated christmas tree should be sporting this Christmas. Ho! ho! ho! here we were walking through the Edinburgh city streets today and we noticed when passing the former Dicksons Gunsmith (now the Barbour) shop, a promotional hound silhouette, cut out designed to attract the gun buying / sporting life customer. Ironic to think that the gun was responsible for the near extinction of the Scottish Deerhound as a breed and now here’s the deerhound in a role reversal, helping to save this little sporting life gunsmith. But shotguns will never be as stealthy, nor as good company as deerhounds tho. 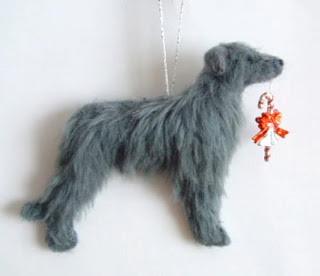 And remember, it’s harder to sneak up on a Scottish Deerhound. 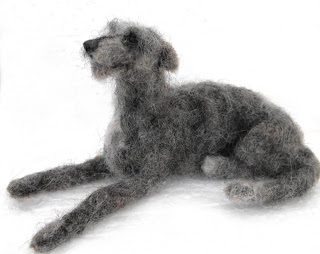 Eagle eyes may have noticed the sleeping deerhound in the country kitchen appearing as part of the recent Cathedral City cheese advert - if you have not, check out the video above. 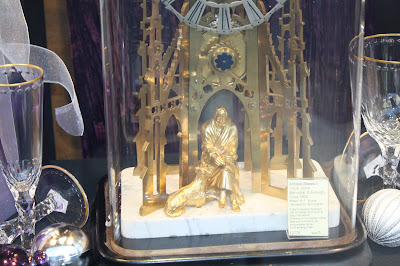 Well done to Cathedral City for choosing such a grande actor as yon deerhound - their cheese is no’ too bad either. Mind you, I do enjoy a good mature Scottish cheddar like the Isle of Mull cheese - hey! why no’ try a wee taste o’ Scotland this coming festive season - these look good. With less than twenty days until christmas day you may be struggling to find a suitable christmas present for we here at Rogues blogspot. Fear not! Whilst walking the usual antique market backstreets of Edinburgh, we came across this interesting little clock in a bell case. 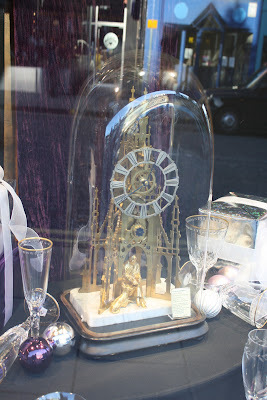 If you enlarge the image, you’ll find as much information as we have about this timepiece written on the accompanying ticket, and the rather low price requested for such a wonderful little (approximately 20" high) mantle clock. 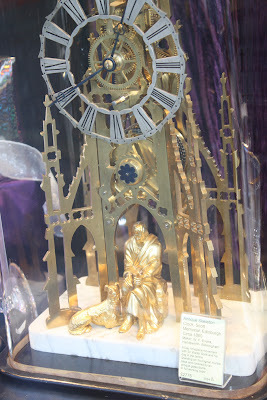 Worth it for the solid gold ‘Maida’ alone I’m sure? We look forward to it appearing in our Christmas stocking this year. And if you are wondering where to send it - just leave a comment with your e-mail address.